If You Live Next to One of These, Are You Likely to Get Cancer? Home » Cancer » If You Live Next to One of These, Are You Likely to Get Cancer? Many people are concerned about the health risks associated with living near a nuclear power plant. While nuclear power was once a rarity, increasing demands from a modern culture addicted to energy use has forced governments and hydro companies to invest in, and build, increasing numbers of power plants. Many people now live in the vicinity of these nuclear-powered generating stations and worry about the risk of radiation poisoning—particularly when it comes to the development of cancer. 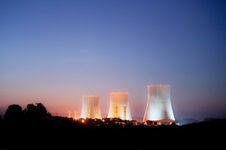 Scientists have been looking at the health risks of nuclear power for some time now. One recent study attempted to find a link between living near a nuclear power facility and the development of leukemia in children. Leukemia accounts for a statistically significant amount of cancer that occurs in children. Researchers compiled data on 10,000 children who were diagnosed with leukemia before the age of five. The research team took note of where the children lived and then compared the numbers. They found no association between living near a nuclear power plant and the onset of leukemia. The researchers also looked at 16,000 children diagnosed with a cancer other than leukemia. Again, results showed there was no risk for any form of cancer that could be directly linked to living near a nuclear power plant. Other studies have not painted such a rosy picture, however. Citizen lobby groups have compiled statistics in their communities that link higher cancer rates to living near a nuclear power station. One famous example was the town of Cumbria in the U.K. In the 1980s, news reporters uncovered data that seemed to link an unnaturally high level of cancer cases in children to living near the Sellafield nuclear power plant. While experts continue to debate the results of long term studies, let’s take a look at the potential health threats you could be exposed to if you live near a nuclear power plant. Radiation exposure is the biggest concern for most people. What is radiation? In a nutshell, it’s energy generated by subatomic particles traveling at the speed of light. These particles travel at such a high velocity—186,000 miles per second—they can penetrate deep inside the body when they come into contact with it. This “collision” leads to damaged cells, which in turn opens the door for cancer to take hold. The good news is that you are struck by 15,000 particles of radiation every second in the normal course of a day. Exposure to natural radiation is estimated to cause about one percent of all cancers. Living near a nuclear power plant might increase your risk by 0.002%—the equivalent of shortening your life expectancy by one hour. When compared to the three to 40 days you could lose as a result of exposure to chemicals produced in the burning of coal, oil or gas, this seems nothing to be alarmed about. Of course, these numbers are far less comforting if the nuclear power plant you live near has a radiation leak—as happened to devastating effect in Chernobyl and more recently at the Fukushima nuclear power plant in Japan which was damaged by a massive earthquake and subsequent tsunami. You can take some small comfort in knowing that nuclear power plants in both Canada and the U.S. come with multiple back-up systems intended to contain a leak during structural failure or because of human error. “Nuclear plants ‘do not raise child cancer risk,” BBC News web site, Sept. 13, 2013; http://www.bbc.co.uk/news/health-24063286, last accessed Sept. 17, 2013. Cohen, B.L., “RISKS OF NUCLEAR POWER,” University of Michigan web site; http://www.umich.edu/~radinfo/introduction/np-risk.htm, last accessed Sept. 17, 2013. Bithell, J.F., et al., “Leukaemia in young children in the vicinity of British nuclear power plants: a case-control study,” Br J Cancer. Sept 12, 2013.